Most of us know of famous fests around the world with a trip to the next Tommorowland, Coachella, Oktoberfest and Burning Man planned in our bucket list. 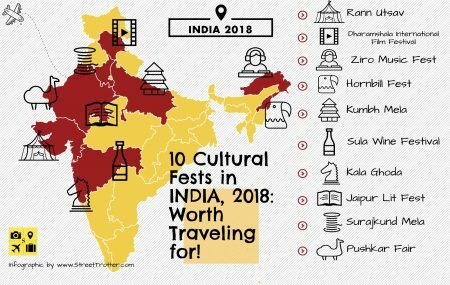 But how many of you have already check listed the 10 most famous cultural fests in India? If you failed to notice – India, the hub of varied tradition and vivid culture – is also the venue to some landmark global events – such as the legendary Kumbh Mela and the yearly Jaipur Literature Fest. Adding on each year are new events that are celebrating India’s rich landscapes, music, dance, history, and also our growing market of independent cinema and music.